As Latin America Product Manager at Dial A Flight I’m fortunate enough to often visit this amazing continent. Its my job (lucky I know) to explore destinations, check out hotels and attractions all of which I’m going to share with you. I often like to travel away from the main tourist trails and discover up-and-coming destinations. Today I’d like to share my tales and tips from a recent visit to Argentina and its rugged and spectacular North West region. 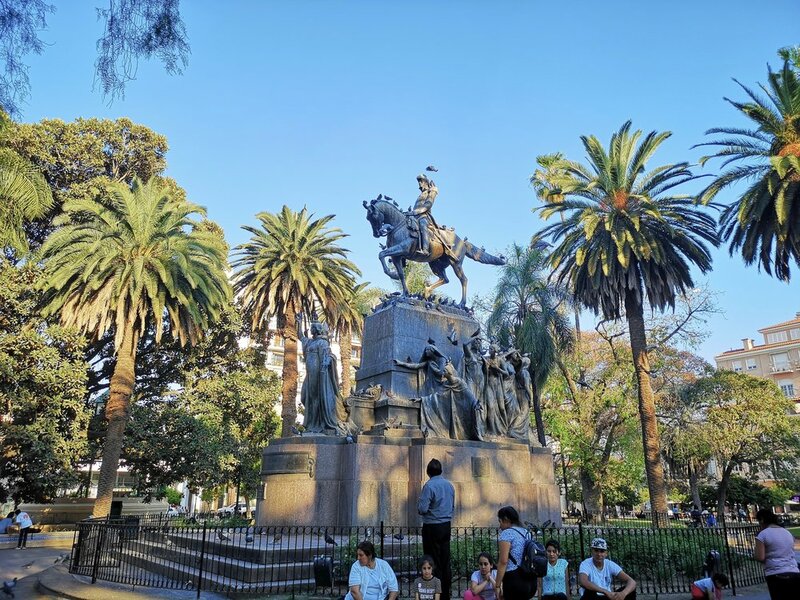 No trip to Argentina would be complete without a visit to the chic and bustling capital of Buenos Aires. I love this city but will talk about this another time. I spent a week there working at a travel trade show and tagged on a few days so I could discover some of the country’s hidden gems. 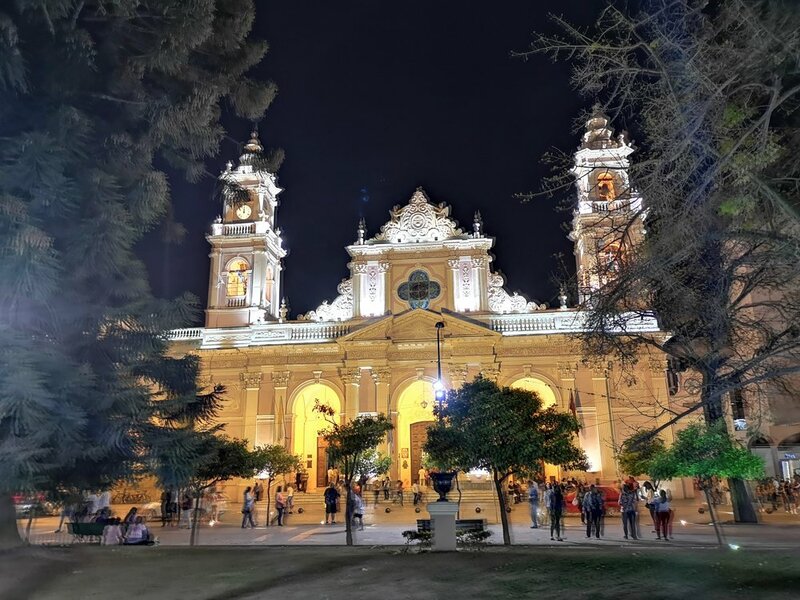 Salta and the North West region is often overlooked for more well known highlights like Iguassu Falls and Calafate (equally amazing), but it’s a must in my eyes. On a sunny September Saturday morning, a tad hungover after a crazy night with too many Latinos, I took the two hour flight from Buenos Aires to Salta. I woke up just as we were about to land and the scenery took my breath away. Rugged Andean mountains and timeless dusty villages interspersed with green valleys and miles of vines. This region is the second biggest wine producer in Argentina after Mendoza – the Malbec producing region we have all come to know in recent years. Another reason for my visit of course! Picked up by my driver in his trusty Ford Ranger, I was to make a quick stop at a delightful 100 year old estancia on the edge of town called House of Jasmines. It was so I could check out the rooms. Unfortunately my visit, although prearranged, clashed with a local wedding so I could not get access. I can however highly recommend staying here if you don’t want to be in the city and it’s only a 15 minute drive away. It has elegant rooms, a spa, pool and great restaurant to ensure a romantic and relaxing stay in beautiful surroundings. My home for the next two nights was The Design Suites, Salta. A modern and contemporary hotel with a cool roof-top pool affording great views over the city centre – dazzling by night. As I didn’t have much time in the city itself I went straight out and headed to the main Plaza De 9 Julio. 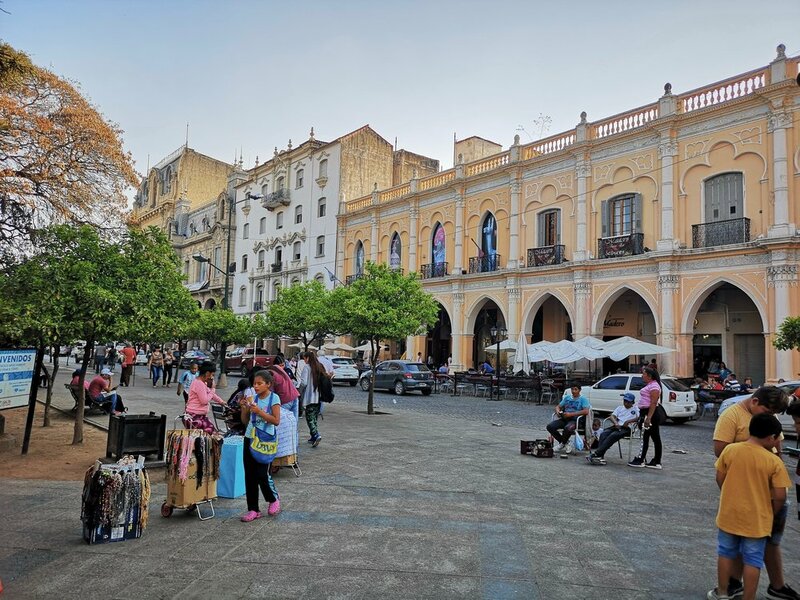 I sat outside in a bustling café overlooking the palm tree-lined square with its cobbled streets whilst admiring the stunning colonial buildings that surround it. Now I know why it’s known locally as Salta La Linda (pretty Salta). 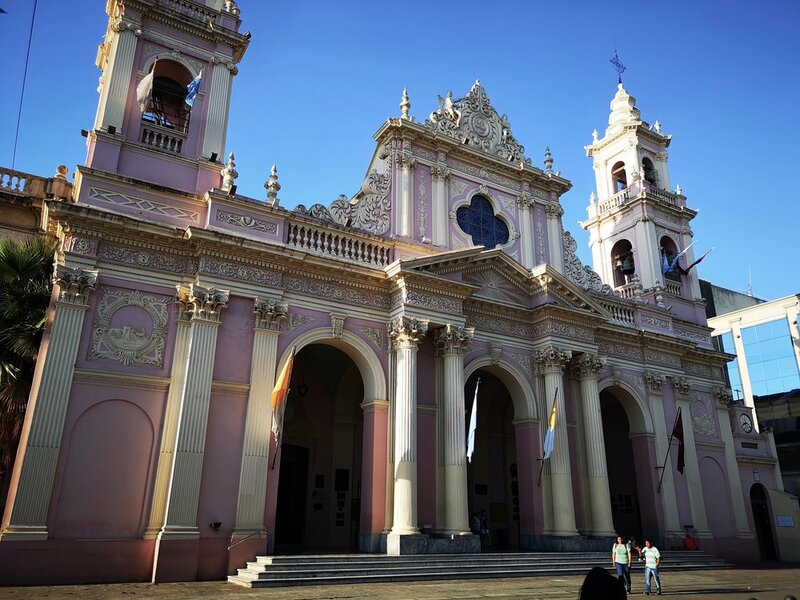 You can use Salta as a base to visit many highlights of the region but they’re long days and long drives, so hang here and have a day free. Visit the stunning cathedral and other well preserved Spanish colonial buildings. Go to the Museo Arquelogia de Alta Montana where you’ll find on display a mummified Inca child preserved from around 1500 AD. Take the cable car up Cerro San Bernardo and watch the sunset or just hang out and enjoy its many good bars and restaurants. The empanadas here are to die for (dinner sorted) and being a Northerner, I think I am capable of living off pasties. Next morning I was up at 6am for my full day tour to visit some spectacular highlights heading North to Juyjuy province and towards the Bolivian border. Ancient Andean culture remains strong in this timeless region unlike the rest of Argentina. I was on a minibus with a group of Argentinians and Italians who adopted me for the day. I shared their friends and their lunch table. I honestly find Argentinians some of the friendliest, most tactile people I have come across in my travels – lookers too I might add. Luckily I speak good enough Spanish to converse and I insisted my guide didn’t repeat the tour in English, so I could practice, or switch off! First stop the village of Purnamarca which is placed at the base of a striking multi-coloured mountain called Seven Colours Hill or Cerro de los Siete Colores. It sounds better in Spanish. The bustling, dusty village with its adobe houses is ram packed full with local craft and market stalls supplying all the bus loads of tourists with colourful textiles and souvenirs. The Italians nearly filled the bus! Wherever you look the mountain is there. Spectacular. I had my coca tea to help with the altitude as it gets to 3000 meters above sea level on parts of the trip. I can assure you after many times of partaking you do not get high… just for reference. From here, we headed further North to Tilcari another Andean village currently growing in tourism and a recent invasion of some hippies apparently. It’s surrounded by spectacular cacti strewn landscapes and mountain ranges and a strange recently built Inca ‘ruin’ on the hill. We then had lunch in the colonial town of Humahuaca with more market stalls and souvenir shopping. Silver is really good and cheap to buy here and I picked up some stunning jewellery, made by the hippies. It’s not all tat. This was an enjoyable yet full-on day as we didn’t get back to the hotel until around 9pm. I highly recommend to leave town and stay in Purnamarca or Tilcari if you are more relaxed and don’t mind rustic. From there you’ve two other major highlights. Unfortunately, I didn’t have time to do them – Salinas Grandes, the Salt Flats, not as grand as Uyuni in Bolivia but equally impressive nonetheless. Also Tren A Las Nubes (Train to the Clouds) a hair raising yet exhilarating tourist train journey over a viaduct of 4400 metres that connects Argentina to Chile. Not for vertigo sufferers!